Chicago Motorcycle Accident Lawyer | Power Rogers & Smith, L.L.P. Power, Rogers & Smith, L.L.P. is one of the premier personal injury law firms in the state of Illinois. With more than $4 billion in verdicts and settlements, we know how to secure justice for clients and maximize their recovery. The cases we handle are most often catastrophic in nature, dealing with your most critical issues. If you or someone you love was involved in a severe motorcycle crash, we invite you to contact us today for a free review of your case. Motorcyclists are not offered the same protections as vehicle occupants. Motorcyclists are exposed to the open road and other motor vehicles without the added protection of vehicle walls, a seatbelt, and airbags. In the event of a collision, motorcyclists often suffer devastating and life-altering injuries. Not only have we won more than $4 billion in verdicts and settlements for our clients, but that amount is also $800 million more than our closest competitor since 2000. 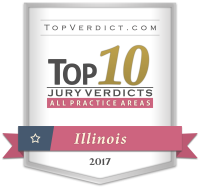 Attorneys at our firm have also recovered a number of record-breaking awards as well, including a $100 million wrongful death result – the largest award for a single family in the state of Illinois. For our experience, integrity, and results in the field of personal injury, we have had the honor of being listed as one of the “Best Law Firms” by U.S. News, among many other honors. If you or a loved one was involved in a serious motorcycle collision, get in touch with the lawyers at Power Rogers & Smith today! 1.5 percent of all crashes involve motorcycles, but 16.7 percent of all fatal crashes and 5 percent of injury crashes involve motorcycles. A majority of the individuals killed or injured in motorcycle accidents are 45+ years old. Most of those injured in motorcycle accidents were injured in crashes that occurred in urban areas on city streets and roads. A majority of motorcycle crashes occurred while the motorcycle was driving straight ahead, indicating fault of another driver. The second and third leading maneuvers before accidents are skidding/loss of control and being in stop-and-go traffic. If you or someone you love was injured in a crash, call a Chicago motorcycle accident lawyer at Power Rogers & Smith today for a free consultation. A: Yes, speak with your insurance agent even if the other drive is at fault for your injuries. However, do not speak with your insurance provide (or the other driver’s insurance company) before you speak with your attorney. Can I Sue for Damages Even If I’m Partly at Fault? A: Depending on the nature of the accident and your level of liability, it may be possible for you to file a lawsuit for your damages. Traffic accident liability can be complicated, so the only way to truly know if you have a legitimate case is by speaking with an attorney. A: If you’ve been in a motorcycle accident, now is the time to speak with a legal professional. Gather as much information as you can about your case and schedule a consultation to discuss your legal options.